When Guillermo del Toro is given the reins of "The Simpsons" opening credits - and especially for the Halloween episode - you know the results are going to be pretty magical. For this Sunday's "Treehouse of Horror XXIV," del Toro is using nearly every horror reference in the book in a ghoulish couch gag, one that reinvents "The Simpsons'" opening credits. As del Toro told Entertainment Weekly, “'The Simpsons' titles are so iconic and yet they’ve never been riffed in this vein. 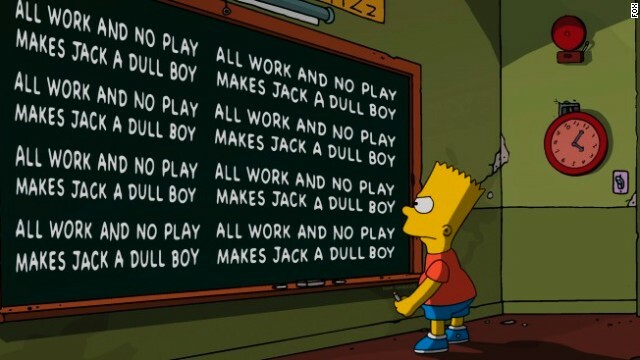 I really wanted to land the connections between the [Simpsons'] set pieces and the titles and some of the most iconic horror movies, and intersperse them with some of my stuff in there for pure joy." The "Treehouse of Horror XXIV" will, as with editions past, be made up of three frightful stories. In one, Homer wanders about Springfield causing terror, and in another, Bart gets beheaded in a kite accident and his noggin gets reattached to Lisa's body. The episode airs on Fox on Sunday, October 6 at 8 p.m. ET. I think Del Toro is a very talented man. Too bad he supports and defends Roman Polanski. I'll never support a Del Toro project ever again. My humanity's justice and compassion hardwiring overrides it's appreciation of art. Hey BV! Where do you see those? I'm not seeing any. Btw, how are ya? There are several websites that do animated p0rn based on Simpsons, Family Guy, etc. Not hard to find with Google or Bing. Learn to spell and use the language you d-bag.